Have you every tried Holland House Cooking Wines or cooking with wine at all? I tried cooking with wine once. A friend told me that you can take the worst wine and use it to cook with and it would enhance anything. So, I had a stew type dish in the Crock Pot and thought I would wine, I had a bottle I knew I wouldn’t drink, so I poured the whole bottle in… well, that’s not how you use it, come to find out ! So, that was a disaster! So, I had not tried adding wine to a dish again until Holland House sent me two cooking wines to try, a white and a red. I have to say they have been great in everything we have used them in so far! Also they are sugar/fructose free which is how Hubby and I are eating now, so that worked out perfectly! We have used them in hamburgers, with chicken, in gravies, and some veggie dishes and are really enjoying the flavor they add to each dish! As I said these wines are great to use in sauces, stews, marinades, and gravies and more! There are great recipes and more info on their website: Holland House Flavors. You can also sign up to get recipes, tips, and even coupons! 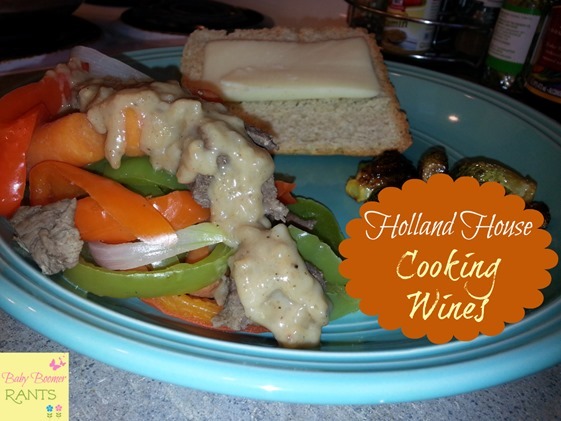 So, if you have never tried cooking with wine or you haven’t tried Holland House Cooking Wines, give them a try, you can change up the dishes you make everyday and add a new flavor!